The temperature in Kathmandu Valley plummeted to just 2.5 degrees Celsius while its maximum recorded temperature on the day was just 16.4 degrees Celsius. KATHMANDU, Dec 18: Since the start of winter, Kathmandu Valley residents are to be seen soaking in the sun whenever possible. But with thick fog and cloudy weather lasting throughout the day, Monday was different as the denizens shivered in what turned out to be the coldest day so far of this winter.The temperature in the valley plummeted to just 2.5 degrees Celsius while its maximum recorded temperature on the day was just 16.4 degrees Celsius, according to the Meteorological Forecasting Division (MFD). This satellite map taken from MFD website shows cloud cover over Nepal on Monday evening. Valley denizens were seen huddling around fires lit on safe corners of various inner streets in the morning and evening. Meteorologist Manju Basi said Monday's frigid weather condition was caused by Cyclone Phethai developed recently in the Bay of Bengal. The clouds developed in the aftermath of the cyclone entered Nepal from the east on Sunday. It especially affected the eastern and central regions as well as some parts of the western region.“The effect of the cyclone will continue on Tuesday as well. But the clouds will start departing the country from the west from Tuesday evening, clearing the cloudy weather,” informed Shanti Kandel, another meteorologist at the MFD.According to her, there are possibilities of rains in some parts of the affected regions on Monday night and Tuesday. Likewise, snowfalls are likely in the high mountainous areas of eastern and central parts of the country, she added.Cyclone Phethai that caused the current weather condition has not settled yet. However, it made landfall at Andhra Pradesh's Katrenikona on Monday, meaning the eye of the cyclone moved over on the land from the sea. Times of India reported that the cyclone triggered heavy rains, uprooted trees and electricity poles and claimed one life when it barreled through coastal Andhra Pradesh.“The intensity of a cyclone decreases after landfall, causing its effects to weaken and eventually subdue. 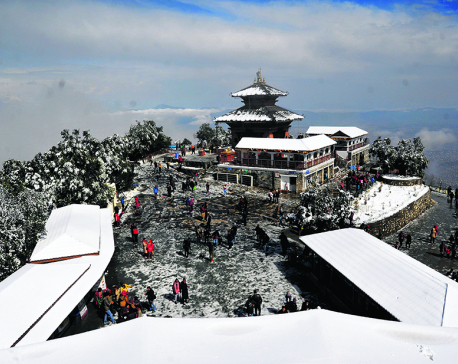 We expect Phethai's effects to fully subdue within 3 days,” said meteorologist Kandel. Although Kathmandu experienced its coldest day of this winter, Jumla had the lowest temperature on Monday with its temperature dipping to -6 degrees Celsius. Jiri and Jomson too had colder day in comparison with temperature of -2.5 degrees Celsius and 1 degree Celsius respectively.